This Month the SHF is hosted by Mmm, Tasty. As I learned this month's SHF theme was "Tasty Locavore Treats", so I thought I must show the yellow raspberries from the farm which is only 2km away from our home. I get acquainted with learned 2 years ago. I was very excited by these raspberries which have nearly the same taste as the rose ones have. I went extra for this event with my son and husband to the farm to pluck yellow rasberries, of course not only yellow ones. 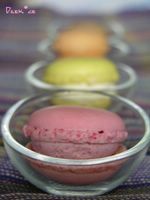 I didn't know what I should make out of them, so I have tried various desserts of own creation. Base: Bought genoise cake, cut in the form you use as mold. 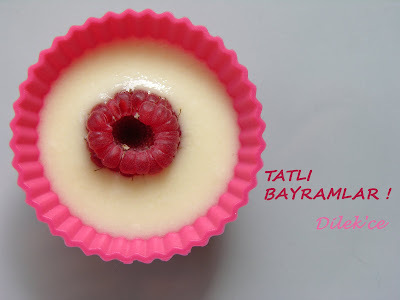 Melt the butter and sugar for a few minutes and add the cream with agar agar slowly. Heat the cream and stir it until it cooks for 2 minutes. Pour the warm Panna Cotta mixture in the mold you want to use. Chill it until it becomes firm, which will take at least two hours but I let them over night. 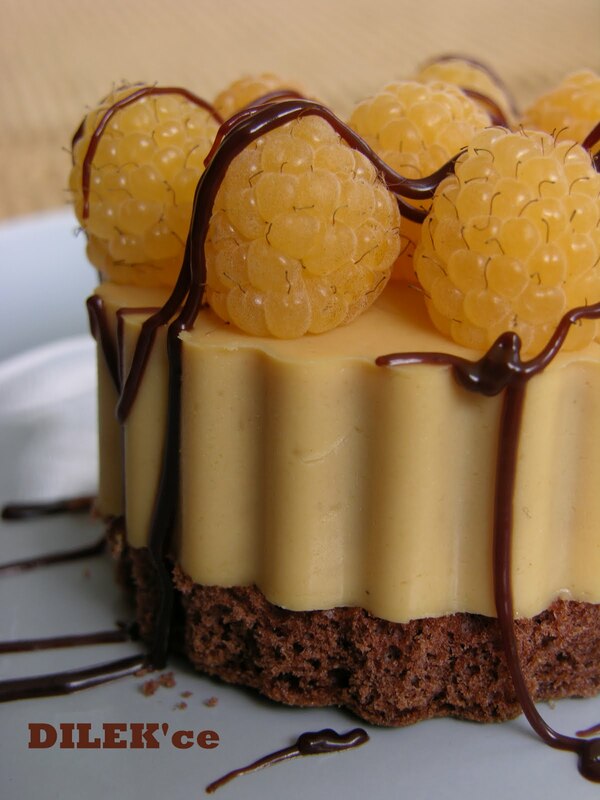 Run a sharp knife around the edge of the Caramal Panna Cotta and unmold onto the cake base and garnish with the yellow raspberry and decorate with melt chocolate. For the base I used a ready-to-use Génoise Cake. I spike the base with 2-3 spoons rose sirup. Melt the chocolate and butter in a double boiler or microwave. Mix in another bowl the mascarpone, sugar and whipped cream till smooth. Stir the chocolate into the cream. Put the raspberries on the base. Spoon the cream on the base. 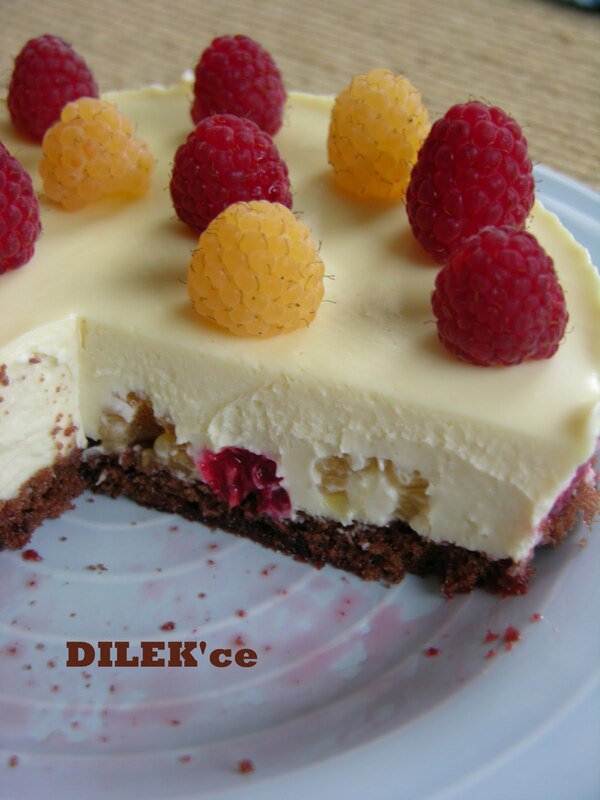 Decorate with raspberries to serve. mmmhhhhh das sieht lecker aus!! Wo flückst Du die feinen Himbeeren?